This post first appeared on Pieria in November 2013. Throughout history, humans have dreamed of plenty. They have longed for there to be abundant supplies not only of essentials, but of luxuries. The promise made to the Israelites wandering in the desert was that they would eventually come to a land “flowing with milk and honey”. And the vision of the New Jerusalem in Revelation is of riches beyond imagination. Recent forecasts of forthcoming abundance, too, have focused on the benefits. Imagine a world in which everything was so plentiful that not only the essentials of life but the luxuries, too, were free. There would be no need for money, because nothing could be bought or sold; and there would be no need to work, because there would be no need for income. And if everyone believed that such “superabundance” would last forever, then there would be no need to worry about the future – no need to save or prepare in anyway. There would be no point in deferring consumption in expectation of future returns: in a superabundant world, there could be no greater returns in the future. Consumption would be the only virtue. It’s a hedonist’s idea of heaven. But these “benefits” have a dark side. Price is a function of scarcity. If everything is superabundant, nothing has a price – that is why everything would be free, and money would be unnecessary. But price is also the principal means by which we measure value. If there is no price mechanism, how will we establish value? Would every good, every service be regarded as of equal value? Or would the value of goods and services be determined by popularity rather than price – what we might call the Facebook approach to valuation (the most valuable product is that which gains the greatest number of “likes”)? Perhaps “likes”, or clicks, or phone votes would become a new measure of value – a new form of price. But what would happen to the goods and services that were less “in demand”? Would producers that didn’t have enough likes stop producing? If so, then a superabundant world would in important respects be less abundant than our present scarcity-driven world. There would be no shortage of goods and services, but there might be a serious shortage of diversity. As Henry Ford put it, “you can have any colour you like as long as it’s black”. Why bother to create diversity if it’s going to reduce your value? And it is scarcity that creates the desire to innovate. In a superabundant world, why would anyone bother to innovate? The greatest value would be achieved by being a monopoly provider of a single standard good or service that never changes. After all, if there are no alternatives, everyone likes you. We’ve seen this before, in command economies: in East Germany, everyone liked the Trabant, didn’t they? In a superabundant economy, money would be unnecessary, both as a medium of exchange and as a store of value. The irrelevance of money as a medium of exchange follows from the fact that nothing would have a price – though Facebook “likes” and their equivalent would act in some ways like a new form of money. But the irrelevance of money, and indeed of all assets, as a store of value is perhaps less obvious. If superabundance is believed to last for ever, there is no point in saving. Indeed, if everything is free, in what could you save? There is nothing that can store value, because there is no value to be stored. The value of an asset that can’t be consumed is given by the present value of the consumption goods that it could purchase at some time in the future. If the value of all consumption goods at all times in the future is zero, then the asset is worthless. So in a superabundant world, all financial assets used as stores of value would by definition be worthless. Some physical assets, such as fine wines, art, antiques and jewellery would still have value because of their scarcity – not everything can be abundant. But what would be their purpose? They would have no purchasing power in the future, because everything is free. You would do better to drink the wine, hang the picture on the wall, use the antiques and wear the jewellery. At least that way you will gain pleasure from your assets. There would only be any point in saving if you believed that superabundance would come to an end at some time in the future. The “hyperinflationary Armageddon” disaster stories that are circulated by investment advisers promote this belief. But if the future is superabundance, it is the investment advisers themselves who face disaster. If superabundance makes saving pointless, their industry is doomed. Although we dream of abundance, we actually don’t like it. Abundance – especially if production is automated – means that people don’t have to work. And that attacks our moral beliefs about hard work being “good” and laziness “bad”. Abundance means there is no point in saving. And that attacks our moral beliefs about thrift being “good” and profligacy “bad”. Abundance means that things we now consider valuable become worthless. And that attacks our moral beliefs about property and ownership. For if everything is free and everything is abundant, “ownership” is irrelevant, and defending property “rights” is ridiculous. What is the point of “defending” something that anyone can get for free anyway? No-one is going to take it from you. Theft is nonsensical in an abundant world. Of course, I am describing an extreme world. But we are already a long way down this road. Larry Summers observed that the rate of interest that would sustain full employment has been negative for a long time and shows no sign of reversing. There has been considerable discussion of an “excess of capital” that forces down interest rates because it doesn’t have a productive home. But Randall Wray turns this round: for him, it’s not an excess of capital but a shortage of productive investment opportunities that is the difficulty. The problem is that “capital is way too productive”. The amount of capital needed to produce all the goods and services for which there is demand is falling – fast. This is happening partly because production itself is becoming cheaper and more efficient, but partly also because of the labour “glut” that cheaper and more efficient production causes. In Western economies, wages are stagnating and full employment has become a thing of the past: unemployment and – perhaps more importantly – under-employment have become entrenched. All of this is consistent with a trend to abundance. It is not so much that people will no longer need to work as that there will be little paid work for them to do (though that doesn’t mean that they can’t do useful and productive things). And it is not so much that people will no longer need to save, and companies will no longer need to generate profits, as that there will be little need for the capital that they wish to invest. As the productivity of both labour and capital increases, the need for them diminishes. This is why the economy is creating bubbles. Those with assets are desperately looking for yield, and governments are desperately trying to generate jobs. 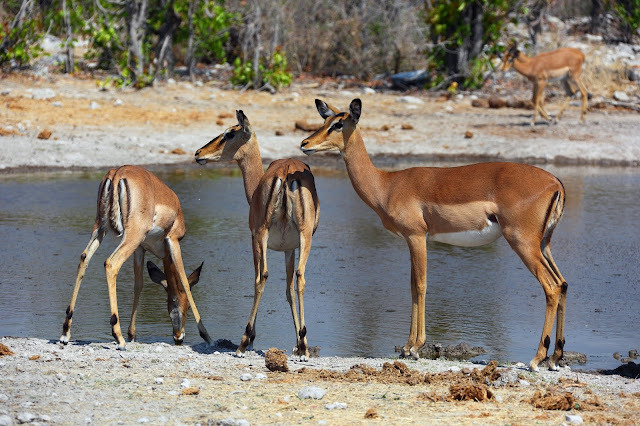 Like animals in a drought, investors and governments crowd into the last remaining waterholes, as the water in them gradually evaporates. This is a world of plenty. We have all we need, and we can create all we need. Yes, there are pockets of scarcity – energy, for example, and minerals, and even water. But all of these are problems that can be solved. The question is whether we really want to. For the scarcities that we hang on to, and that we create through artificial support of asset prices and systematic rigging of markets, are all that separates us from our familiar world and the desert of plenty.